Creating fire is easy, yet understanding and learning to live with this friend and foe has never been easy; stopping fire is a dangerous—often deadly—pursuit. Drawing on his experiences as an environmental historian, firefighter and life safety educator, author Einar Jensen presents an eye-opening look at fire and our history of dealing with it, then gives us the tools for being responsible and prepared—as parents, as communities, and as homeowners in the wildland urban interface. Plus 29 Ancient Myths about the Origins of Fire, and a detailed appendix with Resources for Dealing with Youth Fire Misuse, Suggested Reading, Online Resources, Glossary, and more. "Ancient Fire, Modern Fire is a really good reference book for educators – including safety specialists, classroom teachers, and fire prevention specialists. The book provides historical and mythical information that is very hard to find in any organized fashion elsewhere, and it offers a good summary of information on youth and firesetting. I agree fully with the author's assertion that knowledge about fire must be accompanied by 'cultural instructions' that help us protect ourselves, use fire wisely, and safely manage the fires that occur – whether we want them or not – in our wildlands." 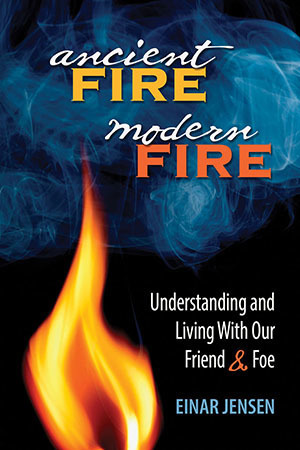 "Great book about the complex relationship humans have with fire! Einar does a wonderful job of bringing together the old legends and myths from many different cultures with America's current use and flawed perspective of this great force we use every day. This book should be required reading for every new recruit in the fire service and placed in every fire station as a resource. As important as this book is for those of us in the fire service it is also a phenomenal teaching tool for the general public. Until everyone completely understands and respects fire, this country will continue to see preventable and needless death and damage related to human's carelessness with fire." Einar Jensen, a veteran community risk reduction specialist, works for Colorado's South Metro Fire Rescue Authority's Preparedness Division directing their wildfire mitigation program and educating students and the public on fire and injury prevention. Prior to leaving the mountains, he was a volunteer firefighter for Clear Creek Fire Authority for twelve years and, concurrently, volunteered for eight years for Clear Creek Sheriff's Office Marmot Wildfire Crew. He studied environmental history at the University of Montana and University of Puget Sound and considers himself a recovering print journalist. He is an active member of the Fire & Life Safety Educators of Colorado.